HOMANN HEIRS. - Ingermanlandiae seu Ingriae novissima tabula luci tradita. . .
Ingermanlandiae seu Ingriae novissima tabula luci tradita. . . - HOMANN HEIRS. Title : Ingermanlandiae seu Ingriae novissima tabula luci tradita. . .. Size : 18.5 x 21.9 inches. / 47.1 x 55.7 cm. Colouring : In original colours, with later addition. 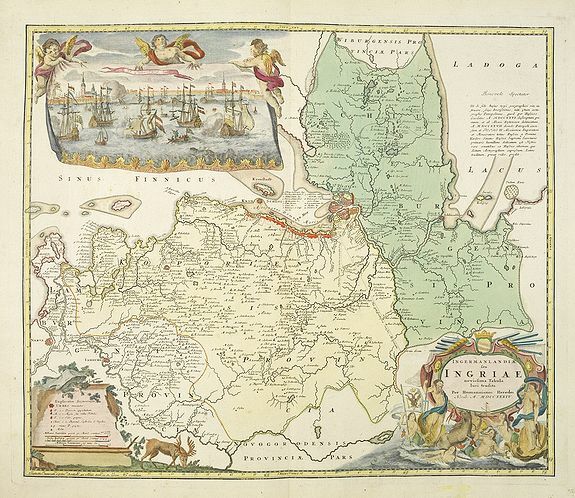 Description :Detailed map centered on Saint Petersburg. With imposing title cartouche and panoramic view of Saint Petersburg. The map was drawn shortly after the conclusion of the Great Northern War between Sweden and Russia, when Russian control over the area was firmly established. Excellent detail of many small towns and villages, the River Neva, and the many small islands upon which St. Petersburg is built. Upper left is a large panoramic view of the city from the water, showing an apparently fictitious naval attack on the Peter and Paul Fortress. Elaborate cartouches surround the title and symbol key, making the map unusually decorative. This is the second of two states of this map, with a notation in the bottom border indicating that longitude is measured from the Ferro meridian, 20 degrees west of Paris. Condition : In very good condition. The cartouches are in later colouring.